It only takes a few days of being reunited with my mother, cooking in the kitchen with her, even a kitchen far away from her own, for me to learn new things. Over Christmas, she showed me how to deepen my pan sauces by deglazing the pan drippings with a stock, and then letting the stock reduce to almost nothing, browning the pan up again, and deglazing again. A simple trick that makes a huge difference and that I definitely need to dedicate a blog post to explain once I get back home. This trip, she’s taught me to broaden my thinking of fish sauces beyond the lightness of lemon and beurre blanc. When we spotted some gorgeous wild salmon at the local supermarket, she said that she had the perfect sauce for it. A red wine reduction sauce. My first reaction was doubt, thinking the red wine would overpower even a full-flavored fish like salmon, but I wisely kept my mouth shut and observed the master at work. 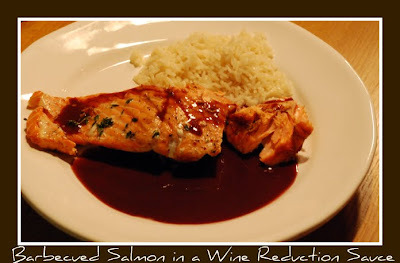 The end result was incredible, the red wine sauce silky and delicious, a perfect companion to the barbecued salmon. We served it with a simple buttered rice and everyone licked their plate clean. 1 stick of butter, room temperature, cut into 1 inch thick slices. In a medium saucepan, pour 1 bottle of red wine, a bunch of thyme, garlic, onion, bay leaf, and the garlic cloves. Over low to medium heat, reduce the wine for an hour, stirring occasionally. At the end of the hour, you will have no more than 1/2 cup of wine left and it will be thick and syrupy. Strain it in a coffee filter to remove all the herbs and other flavorings, leaving only liquid. Meanwhile, cook the salmon. We did it on the grill, but you could also do it in the oven or even pan fry it. 5-10 minutes with skin side down, then carefully flipped for another 1 to 2 minutes. When the salmon is ready, take the wine off the heat, and whisk butter into sauce, one slice at a time. Your sauce will then be glossy and silky and ready to serve atop the salmon. >Wow I wish I could learn such tasty cooking tidbits from my mom. The only useful thing she taught me in the kitchen is not to cook a turkey for 14 hours on high. By taught I mean by example. I’m making a version of this sauce for our dinner group on Saturday. Do you have a favorite butter that you use for the sauce? In my test run I used Costco butter (I alway have it on hand) but I’ll use something nicer on Saturday. Thank you!